Where do you look when coming to an intersection? What is the safest way to drive up to intersections? What is the safest way to drive up to intersections? When turning left at an intersection you should give a glance to your left just to check there's nothing there like a cyclist or motorcyclist. Looking behind you is important. For example, if another vehicle is following you very closely be very careful about turning into driveways as it's easy for them to not be paying attention and run into the back of you. You can start slowing down more quickly to help them adjust their speed. As you turn, you can also glance in your rear view mirror to check there's nothing bearing down on you. You will check to your right and ahead, too. Always look at least twice because this gives you a much greater chance of seeing smaller road users like cyclists and scooters, especially when the light is poor. If you are waiting in a queue of traffic entering an intersection don't be fooled by a driver pulling away, thinking that you can go, too. Many minor nose-to-tail accidents happen when a driver moves forward and then quickly stops. The driver behind sees the driver ahead move forwards and also starts to move forwards. The following driver looks to the right and doesn't realise the driver ahead has now stopped and runs into the back of him. Observe stop signs. If you have stopped behind one or more other vehicles at an intersection with a stop sign you must stop when it is your turn at the intersection. Be careful that there are not crossing pedestrians when you turn. 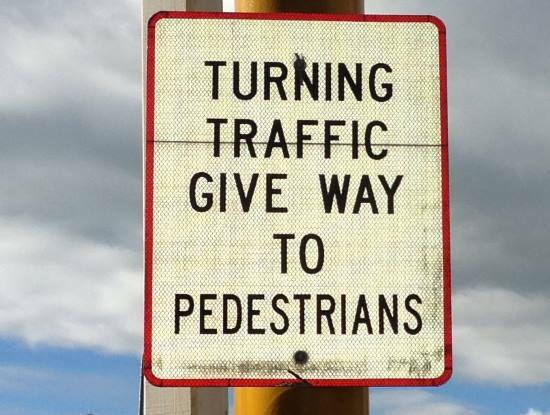 You might see this sign if there are likely to be pedestrians, although by law you must give way to all pedestrians who are already crossing on the road. When driving up to the intersection signal your intention for at least three seconds if you are turning. If you are passing straight through an intersection check left and right in case another vehicle runs a red light, or is likely to pull out in front of you. In busy traffic, vehicles might be trying to pull out of an intersection in difficult conditions - this is especially bad on wet nights. If you see someone struggling to get out of an intersection you can always slow down or stop to let them in if it's safe. If you are driving up to an intersection with traffic lights you should be scanning (looking) well ahead. If you can see that the lights are green in the distance there's a good chance that they will be red by the time you get to the intersection, therefore be prepared to stop. If the lights are red ahead and you know the phasing, you might be able to anticipate the green light and adjust your speed to conserve momentum. Don't get caught out having to brake too late, though, and be careful of red light runners.